Open Swims: Times are Sat and Sun from 2-3:45pm and Tues and Thurs from 7-8:45pm. Cost is $4 per person for ages 4 years and older. Memberships may be purchased at any open swim for the session and allow holders to enter for $0. District resident cost is $50 for individuals and $100 for family memberships. Non residents are $75 for individual and $125 for family. Swimmers who take lessons will be given a separate membership card that allows them to enter open swims for $1.50. Swim Team Practice: These are for swimmers interested in joining the team or just want to stay in shape. Swimmers who have completed level 3 of Red Cross lessons may try it for the first week for free. Practices are held on Monday, Wednesdays and Fridays. Sr. and Jr. high kids are from 3-4:30 and elementary and other districts are 4:30-6pm. 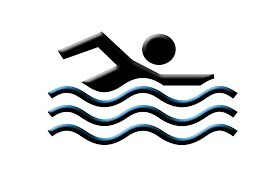 Swim lessons: Registration will be held on March 5th and 6th from 6-8pm in the pool lobby. Residents who took lessons over the current school year are able to sign up on Tues, March 5th. Non residents and other district residents may come on Wed, March 6th. Classes are held one day a week for 45 minutes and run for 8 weeks. Class options are Monday and Wednesday at 6:30, 7:15 and 8pm. Tuesday at 5:30 or 6:15pm. Saturday classes at 12:30 or 1:15pm and may start earlier if there is enough demand. Classes are built upon a fist come, first serve basis. Classes will start on March 9th and the week of March 11th. The cost is $36 for district residents and $44 for non residents. Text Heather McDanel at #717-693-3310 with any questions. Aquacise: This is a fun way to control weight and increase your overall fitness level by use of water exercise. Classes are held two days a week for 1 hour. Classes are Monday and Wednesday at 5:30 pm - 6:30 pm. Classes will be be held March 11 through May 8th.. The cost is $55 for district residents and $60 for non- residents.